I just spent the entire 3-day Memorial Day weekend in garden shops and planting, shopping for flowers and digging in the dirt. Happiness! I adore colors, so my annual spring planting is a joyous experience as well as a LOT of hard work. But I love driving up to my house and seeing all the bright colors in my big flower pots and planters all over. And when I'm relaxing on my backyard patio in my comfy chaise lounge reading, I have to have big pots of colorful annuals hanging from the wrought iron hooks surrounding my patio and lined up along the sides. It helps me relax better. . .honest! These are not my photos, but they are good examples of some of my favorites. The small purple petunias or pansy-petunia combinations which make thick, lush hanging plants. 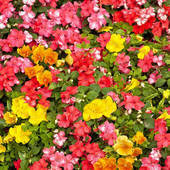 And who can resist those bright impatiens clustered together? Ooooooo, I also found a gorgeous fire-engine red vining begonia. Scrumptious. And some new variety of fluffly pink petunia with two colors. I even fixed a small rectangular plantar filled with varieties of lettuce. I got the idea from my next door neighbor, Ann. And I'm a big consumer of fresh spinach. So when I saw her planter filled with lettuce varieties, I decided to give it a try. I don't know about you, but I like to dig in the dirt with my bare hands. I take my rings off and have at it. Needless to say, I had to wash my hands and clean my nails whenever I came in for lunch or dinner. Perfect timing too. Tomorrow, I'm going in for my manicure. :) Today---I spent the entire day planting. We have beautiful late Spring weather here in Colorado---mid-80s all last week and into this week. And that old Colorado staple---bright sunshine. I swear. . .the weather here spoils you rotten. Oh. . .and the reference to a new book in the title? 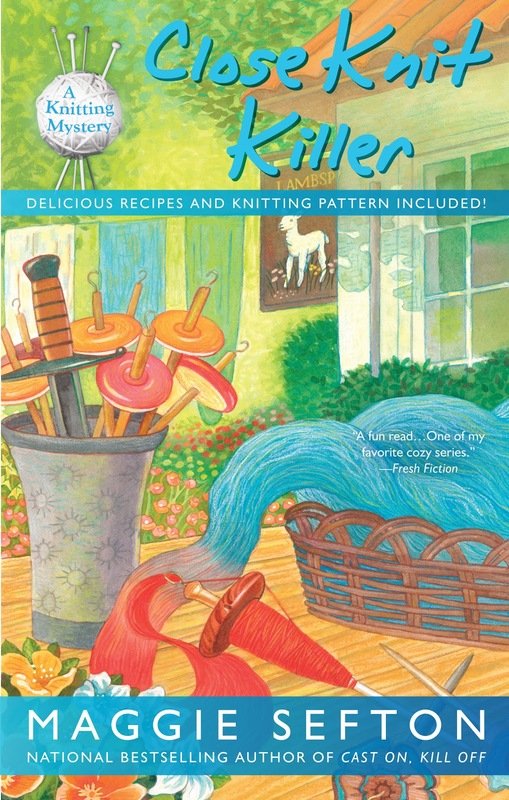 Why, the next Kelly Flynn Knitting Mystery, of course! CLOSE KNIT KILLER, the 11th in the series, will be available next Tuesday, June 4th, in bookstores and online. I'll have more details in next Tuesday's post. Meanwhile. . .back to the flowers. Did any of you spend part of this weekend planting? Flowers? Veggies? Shrubs? Something new? You are a woman after my own heart! My backyard becomes my perfect haven in the summer. All I have to do is look at my flowers to be happy and ever so grateful to be alive. Love your books! We had wicked winds, rain, and 42F on Sat. & Sun. so I planted yesterday, but only my vegetables. I still have my planters to go and a front bed, but I agree, it does make it much easier to relax when there are great splashes of color about. I've attached some window boxes to my deck railings for lettuces and hope to plant them this week. Still the weather here is not good enough to start gardening. The plants that survived the winter are thriving, but it is not nice enough for a few hours of gardening. I recently discovered that you can wear those cheap and thin rubber gloves with gardening, so you keep your hands clean, and still feel everything you do. Love it! And I do love the plants you name, the more color, the better. Naomi---I'm with you. :). All those flowers and their bright colors make me happy. And I love to watch the little plants grow. Also thanks so much for reading. :). This Blogger comment software is glitchy sometimes and freezes. Annoying. Mare---We'll have to compare lettuce stories. :). Good for you. You're planting a lot. Aurian---That's an idea. I'll look for them. How chilly is it there now? It's late May. When do your warm temperatures start? Well, we had 2 days with sunshine, but now it is cold and rainy again, it is way too cold for the time of year. I have the week off work, and was looking forward to gardening a little, going to the gardencenter and such. We usually have really nice spring weather, but not this year so far. I rent so I can only container garden but I do quite a bit of containers of colors and veggies. A friend of mine wants to make me a raised bed garden for veggies. That would be delightful. I love going to garden centers, its part of my spring ritual to research what my containers will be for the new season.